As we all are were expected, Apple has officially releases the fifth beta version of iOS 7.1. Registered iOS developers and non-iOS developers (general users) can upgrade/update their devices on Apple iOS 7.1 Beta 5 (Build: 11D5145e) Firmwares. The official Direct Download Links of iOS 7.1 Beta 5 IPSW Firmwares for iPhone 5S, iPhone 5C, iPhone 5, iPhone 4S, iPhone 4, iPod Touch 5G, iPad Air 5G, iPad 4G, iPad Mini, iPad Mini 2, iPad 3G, iPad 2G and Apple TV 3G/2G is available. The Changelog of latest Apple iOS 7.1 Beta 5 (Build: 11D5145e) Firmware contains bug fixes and performance improvements which you can read in below image. The expiration date of iOS 7.1 Beta 5 firmware is Monday, April, 2014 @ 12AM (GMT) and it’s also expected that users will get more beta versions before the final release of iOS 7.1 i.e. 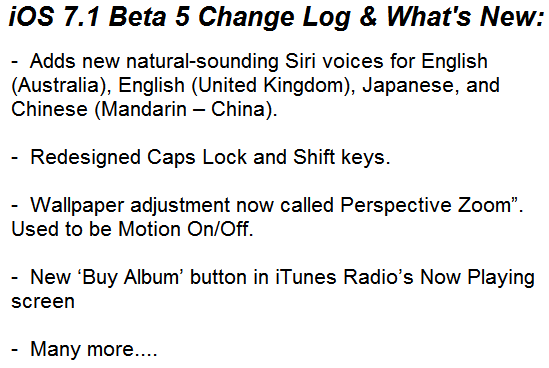 iOS 7.1 Beta 6 or iOS 7.1 Beta 7.
iOS 7.1 Beta 5 Change Log & What's New? 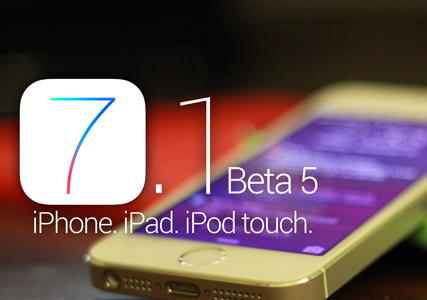 How to Download, Install & Jailbreak iOS 7.1 Beta 5 Firmware? Apple iDevice users can simply use OTA (Over-the-Air) update service through Settings > General > Software Update option on any iPhone, iPad and iPod Touch devices. If you're iOS developer can simply visit iOS Dev Center website for official iOS 7.1 Beta 5 (Build: 11D5145e) downloads and if you're non-iOS developer or general user than you can Download iOS 7.1 Beta 5 IPSW Firmwares for iPhone 5S, iPhone 5C, iPhone 5, iPhone 4S, iPhone 4, iPod Touch 5G, iPad Air 5G, iPad 4G, iPad Mini, iPad Mini 2, iPad 3G, iPad 2G and Apple TV 3G/2G devices from below official links and then use iTunes for manual installation of firmware. Currently, there is no official Evasi0n7 jailbreak tool available for Untethered Jailbreak iOS 7.1 Beta 5 Firmware. We will update our readers once it gets release by team evad3rs.